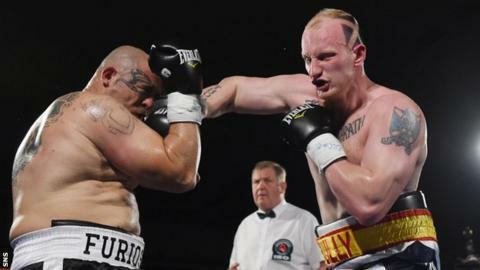 Gary Cornish believes he will defeat Olympic champion Anthony Joshua and lift the Commonwealth title in London. Cornish acknowledges Saturday is the biggest fight of his career and faces an intimidating atmosphere at the 02 Arena, in front of a crowd expected to exceed 12,000. Despite being the underdog, the 6ft 7in Highland-based fighter believes he is a match for his opponent. "He's never fought anyone my size," Cornish told BBC Scotland. "He's never fought anyone with my power. We'll be ready. "I reckon if I fought the fighters he fought I would have stopped them." Both fighters are unbeaten professionally and while Joshua has the superior profile, their records are both strong. Cornish has 12 knockouts from 21 wins, while Joshua boasts 13 knockouts from 13, with none of his fights going past three rounds. "We're both big punchers so I can't see it going the distance," he continued. "I'm a lot different to anyone he's fought. I'm there to win and that's what I'm going to do." World heavyweight champion Wladimir Klitschko recently described Joshua as the most promising boxer he's seen in 25 years. Despite that praise, Cornish's trainer Paul Geddes concedes neither fighter has been tested to their limit so far in their careers. "Both of them have fought similar calibre," said Geddes. "There is no difference to where they are in their skillset and their experience, other than amateur credentials. "It's just been a programme of improvement as each fight has come along and he (Cornish) has dealt with the boxers that have been put in front of him. "It's been clear he's been performing well above any opponent. "We believe the time is absolutely right for Gary to shine against an opponent like Anthony Joshua who is on the ascendancy, but there could be an argument that he has been over-promoted." Cornish is an imposing figure, given his size, and up close watching sparring it is clear he does possess real strength. The question is whether he can utilise that against a fighter of Joshua's ability. Geddes shares his fighter's belief that he can lift the title. "There's no question in my mind he can do something here," he said. "He has galvanised exceptional strength, exceptional power. "The public are going to see a very impressive Gary Cornish and the public are going to see an Anthony Joshua who has his hands full. "There is absolutely no pressure on Gary Cornish. All the pressure is on Anthony Joshua's shoulders, which is a good position to be in."